Preparations for Discovery’s STS-131 mission have encountered a slight hiccup during the installation of the reserviced Forward Reaction Control System (FRCS). The large unit of thrusters – which sits in the nose section of the vehicle – has been uninstalled for repairs to its bolts and seals, ahead of a second reinstallation effort on Thursday, as several processing milestones are carried out for the 2010 flight. Currently targeting launch on March 18, 2010, Discovery’s STS-131 mission will deliver supplies to the International Space Station (ISS) via the Multi-Purpose Logistics Module (MPLM) Raffaello and the Light-weight Multipurpose Experiment Support Structure Carrier (LMC). Discovery’s flow has been proceeding along the schedule milestones, with all three Space Shuttle Main Engines (SSMEs) now installed and undergoing interface checks inside her Orbiter Processing Facility (OPF-3). 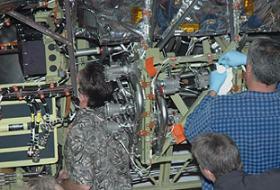 “Got engines into the OV-103 (Discovery) for STS-131. Will get into interface leak checks for those,” noted Pratt & Whitney Rocketdyne/KSC on the Shuttle Standup/Integration Report (L2). “Engines 2045, 2060 and 2054 have been chosen for this flight. These are the first engines to avoid the use of a sponge, used to apply an inhibitor on the engine nozzles, believed to be the root cause for the 100s of pinhole leaks that have been found on the nozzles post-flight. While this is not a flight safety issue, engineers will hope to see a reduction in the amount of holes found, once Discovery returns from STS-131. Following the incident with the PV12 Fill and Drain Value during Discovery’s previous countdown (STS-128), engineers have completed the changeout of the actuator that is believed to be the cause of the unacceptable open/close indications. This actuator was previously scheduled to be removed as part of the nominal STS-131 flow. However, engineers will take added interest in the condition of the suspect hardware, in order to check for proof of a possible bent switch lever, which was one of the key candidates for the out of family indications during tanking – which resulted in a scrub. Following a scrub turnaround – extended by the Mission Management Team (MMT) in order to ensure engineers and controllers involved with the countdown had a full understanding of the status of the valve – Discovery launched without issue. Other work taking place in the OPF includes the removal of one of Discovery’s Thermal Protection System (TPS) tiles on her left hand OMS (Orbital Maneuvering System) Pod, which will allow for the installation of instrumentation relating to the continued effort to gain data on Main Engine Ignition (MEI) Acoustic and SSME (Space Shuttle Main Engine) Ignition Overpressure (IOP) Environments. The Program Requirements Control Board (PRCB) recently reviewed two expansive presentations relating to downstream MEI plans for Endeavour’s STS-130 launch, Discovery’s STS-131 mission, and also the full plan for the remaining flights on the current manifest. Both December 10 presentations are available on L2, with articles to follow. However, the focal point of Discovery’s flow over the last few days has been on her FRCS, which had to be removed shortly after installation, due to an issue with the attach bolts that connect the thruster system to the body of the orbiter. 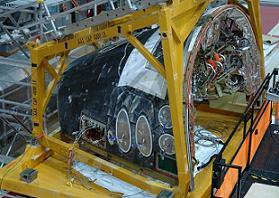 The FRCS arrived in OPF-3 last week, following servicing work in the Hypergolic Maintenance Facility (HMF). Installation had been proceeding to plan, with structural and electrical mates being carried out, prior to issues being spotted by engineers. “FRCS: Due to unresolved problems with attach points 1 and 2 as well as thermal barrier debris that remains between the FRCS module and orbiter bulkhead, the decision has been made to remove FRCS from the orbiter. Operation was completed on second shift Sunday, December 13th,” added NASA Test Director information on the issue at the time. That information was updated this week, focusing on the seals on the FRCS, which also required rework. Reinstallation later this week is expected to go to plan. Away from the orbiter flow, STS-131’s twin Solid Rocket Boosters (SRBs) and External Tank flows are heading towards their own key processing milestones. Stacking of the SRB segments will begin later on Wednesday in High Bay 3 of the Vehicle Assembly Building (VAB), next to the completed STS-130 stack. Meanwhile, Discovery’s tank (ET-135) is continuing to target arrival at the Kennedy Space Center (KSC) before the end of the year, despite a power outage at the Michoud Assembly Facility (MAF) building where the tank is currently located. “In Building 420, All Systems test is complete; just have paperwork to close. Shakedowns and TPS closeouts are the critical path, and are in work,” noted Lockheed Martin’s status on ET-135’s final days in New Orleans. “Had a facility power outage unique to Building 420. Lost power for 2.5 hours. Lost cell environments for the entire first shift, so they were not able to do any pours or primer operations. 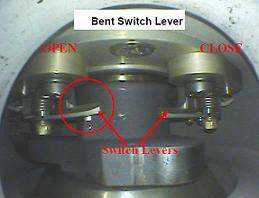 Did do trim operations and completed the All Systems Test, vent valve decay test, etc. “Assessing the impact, and the overall status with production. After the tag up, will advise the Logistics Community of the updated commitment for completion and delivery. Will be inside of the December 23 date.